Snapdragon 636 vs MediaTek Helio P60 Comparison – Which one is better? Qualcomm is the leader when it comes to the smartphone SOC market, and it is due to the impressive Snapdragon chipsets from the company. Right now, the Snapdragon 845 is the best that Qualcomm offers and the same chip is there inside all the latest Android flagships like Samsung Galaxy S9 & S9+, OnePlus 6, LG G7 ThinQ etc. When it comes to the price segment, we know that the budget and mid-range segments are much popular than the high-end price segments. Talking about the mid-range segment, the Snapdragon 636 is the best that Qualcomm offers in the lower mid-range segment (Below $250). But with MediaTek launching its Helio P60 chipset, the competition has become interesting. Some things make the Helio P60 a great processor, like a 12nm manufacturing process, a dedicated AI based module etc. This doesn’t make it superior to the Snapdragon 636, but there is no doubt that it can compete head to head with the Snapdragon 636. In this article, let’s compare the Snapdragon 636 vs Helio P60, based on their benchmark scores and other aspects. In the end, you are the one to decide which one is better as we believe Benchmark scores don’t reflect the real world usage. There are a lot of other aspects that decide it apart from the benchmark scores. 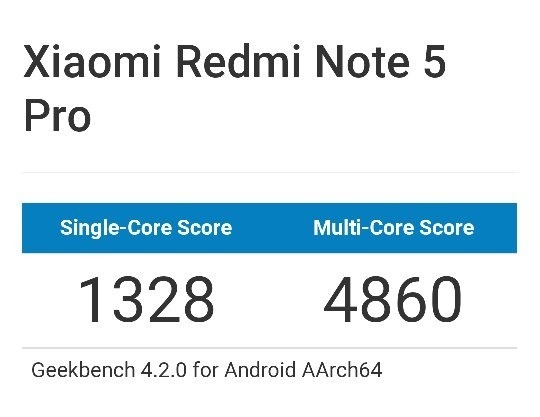 AnTuTu is one of the most popular Benchmarking platforms and talking about the benchmark scores, the Qualcomm Snapdragon 636 processor inside the Redmi Note 5 Pro scored 113K. 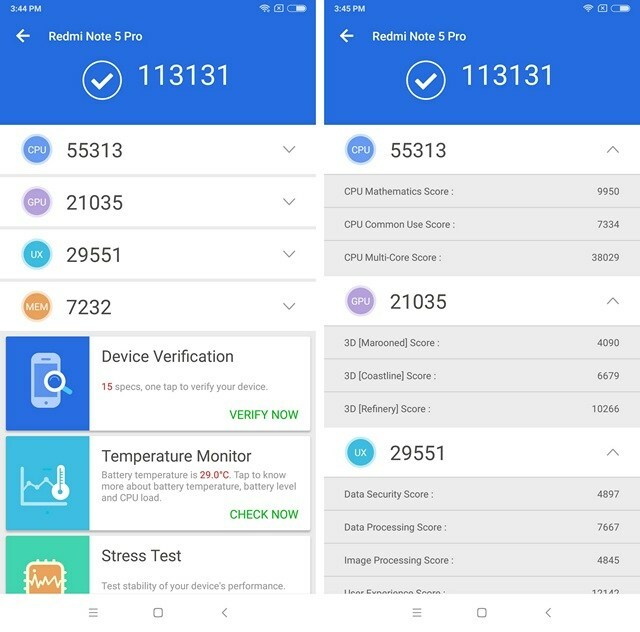 Coming to the Helio P60 chipset, the Realme 1 (powered by the Helio P60) scores 138K on AnTuTu which means Helio P60 scores higher when compared to the Snapdragon 636. 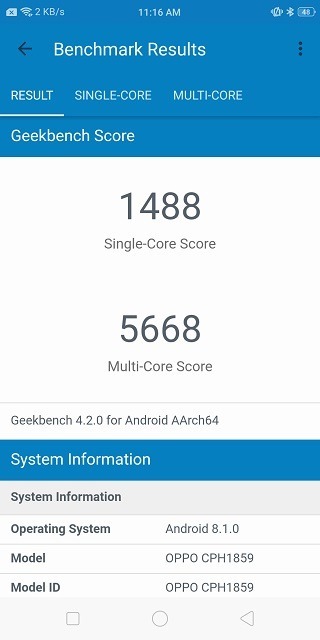 Snapdragon 636 Geekbench ScoreNow coming to the Geekbench score, the Snapdragon 636 processor scores 1300+ on the single core and 4800+ on multi-core. Comparing it to the Helio P60’s single core and multi-core scores of 1400+ and 5600+, it is again clear that the Helio P60 is a winner when it comes to Geekbench scores. It’s time for some GPU test. 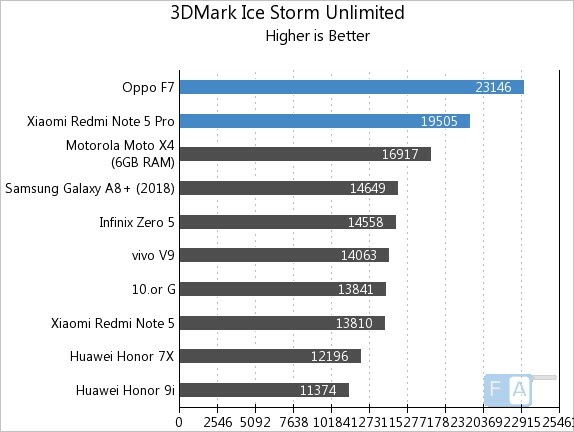 The 3D Mark Ice storm tests the Graphics related performance of a chipset and talking about the scores, the Oppo F7 with Helio P60 scores 23K while the Redmi Note 5 Pro with Snapdragon 636 scores around 19K. Again, these scores show that the graphics rendering is better on the Helio P60. Well, these benchmark scores might show the Helio P60 as a superior chipset when compared to the Snapdragon 636, but you will hardly notice any difference while using these side by side as the real world usage is not going to show which one of better and up to what extent. One thing that makes the Snapdragon 636 chipset better than the Helio P60 is that the GPU is better when it comes to handling high-end games like PUBG Mobile. On phones with Helio P60, you might need to lower the settings to ‘Low’, but you can play the game on Medium settings on the Snapdragon 636 with ease. Now, the 12nm process might make you think that this chipset is more battery efficient as compared to the 14nm Snapdragon 636 but then again, it all depends on the software optimization. Comparing two phones with same battery size, stock android but different chipsets (Helio P60 and Snapdragon 636), the P60 will come on top due to its 12nm manufacturing process and some AI tweaks for improving battery life. But, we all know this is a pretty rare scenario. So, what is your choice when we compare the Snapdragon 636 vs Helio P60? Do let us know via the comments section. Even though everyone’s saying Snapdragon 636 is becoming outdated, I think it still has the power to beat and emerge out as the powerful Mid-Range Chipset. And true, in terms of Graphics, both Snapdragon 636 and 660, pack a punch, thanks to the Adreno GPU. Hmm, interesting line of thought. Although, I think when we are shelling out such big amounts, it is imperative that we get a revolutionary and latest features. Which is why I will always prefer MediaTek Helio P60 over Snapdragon 660, considering it has brought AI features into action. So, just because a technology is new doesn’t mean that it will always be better. Considering what we are dealing with is the Mid-Range Segment, I think Qualcomm is keen on entering and dominating this segment with 625, 636 and even 660. But yeah, I still feel the wrath of not having AI functionalities in this segment. No, you took it the wrong way. It is not dependent on which chipset is new or from which company, but on the performance of the SoC. 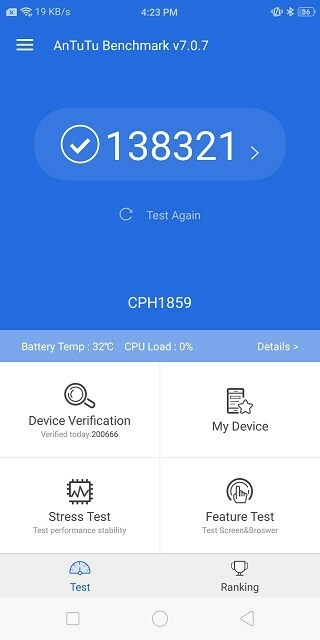 MediaTek Helio P60 scores high on most of the parameters you test it on. The performance is optimized with big.LITTLE architecture and Octa-core chipset, the energy consumption and heating is optimized with CorePilot, and there is a separate module for GPU known as NeuroPilot. Now, if you can get these things under 20K, for me it is revolutionary. Yeah I understand. Well, yes considering these specs Helio P60 scores better than Qualcomm 636 here. To be honest, Mediatek surprised me this time with Oppo F7. Even I like the device, apart from being a bit costly. Very informative article!!! Thanks for sharing your views on such a coveted topic. And yes, MediaTek Helio P60 is a powerhouse. I have seen it’s performance with OPPO F7 and for me it was the best mobile experience – be it multi-tasking, daily usage or even gaming. Now, Realme 1 has been launched with same chipset. Let’s see how it fares. What are your thoughts on it’s GPU then? Even the wrter say that the Gaming causes lags in helio p60 chip, when you play heavy games. Pubg is my favorite and I am happy with it performance on Redmi Note 5 Pro. It has a Qualcomm Snapdragon 636 and suport high graphic setting, which is not in helio p60. For me, the GPU works seamlessly fine. Even I have played games, and even processor tasking and heavy games, and I think the processing is very fluid. I don’t understand why the writer said you can’t play PubG in High settings. I have played the game multiple times in high settinfs in Helio P60 device – OPPO F7, and it never lagged. You seem to a be a pro-MediaTek guy, which is why you say such things. Adreno GPU is way ahead of the Mali GPU. No one should claim without sources. Gaming is way much better in Snapdragon 636 than in this Mediatek P60. So you are disproving my experience altogether? Well, I will continue to stand on my ground that the Mali G72 GPU provides high graphic-fidelity and latest graphic-digestible fluid rendering. It is optimized in terms of shading as it is the latest and has support from powerful Cores. I think MediaTek Helio P60 is carved for heavy data and graphic intensive games, unlike your old and ancient Snapdragon 636. Can you share the full gaming experience in detail? I am confused between Note 5 Pro- redmi, and Oppo F7 now. I have used Snapdragon chipsets till now and thinking about moving to something different. I think you can view these videos for your reference. Both of these videos have MediaTek Helio P60 powered phones playing Pubg in highest graphic settings. Looks like the writer made a grave mistake by misjudging this one. Yahan to sahi hi chal rha h bhai!. Ab, I am thinking about Realme 1 more than OPPO F7, lol! Price Difference matters a lot. Plus, they are giving good Helio P60. Well it all depends on price (at least in India) when we are getting SD636 cheaper than Helio P60 than SD 636 is good but when Helio P60 is cheaper than definitely that’s good, and in case of Oppo realme 1 It’s way cheaper than Redmi Note 5 pro or Asus Zenfone max pro M1 and trust me Helio P60 is doing very well Heat management, Battery performance, Gaming performance everything is good and they are providing OTA updates for improvement in UI so Only in the case you are not a mobile photographer Realme 1 is a deal but Oppo f7 is way expensive than Redmi note 5 pro so definitely untill Realme 1 shown up SD 636 was King but price point makes difference and that’s all we want ‘Competition’.